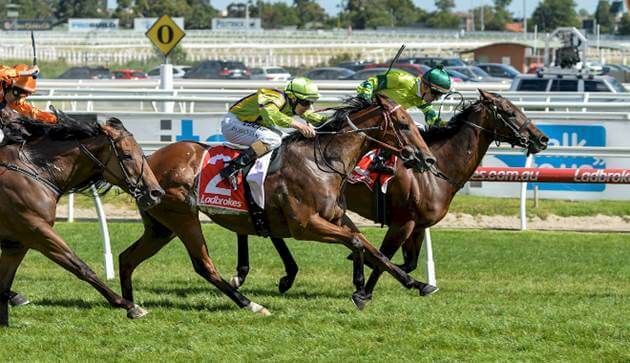 Our Melbourne pro gives a full preview of Saturday's Group 1 Oakleigh Plate. The rail’s out 3m. I’ll walk it today but I’m not expecting too much unexpected. There’s no rain forecast and the wind will again be southerly, which will help the leaders. The pace will be sharp here in what is a wide-open race. Wild Rain will push through to lead and be joined by Faatinah, Sheidel and Flamberge. Fell Swoop will be just off the pace, with El Divino handy back on the fence and Extreme Choice just forward of midfield. Hellbent will be just off midfield, and Kaepernick and I Am A Star will go back. Really like the look of Sheidel (Hayes & Dabernig / Moreira) here. She was terrific last prep, winning on Derby Day with Moreira aboard, who gets on again here. She’s first-up but was impressive in her two jumpouts, and this looks like a real target race for her. Extreme Choice (Price / Newitt) is obviously very high quality. Is first-up here but did win the Group 1 Moir first up last prep. before failing in the Coolmore in an unsuited race. I’ve rated it to it’s best here. I like Hellbent (Weir / Lane), I just hope the good Hellbent shows up! He won here in September in super impressive fashion, running a very fast time for day. He’s had two runs back this prep but was unsuited at Flemington and Caulfield. This looks like a target race. Flamberge (Weir / Rawiller) looked alright in the Lightning and won this race last year, but is a year older and probably not quite at the mark of some others here. Fell Swoop (Dale / Oliver) completed last year’s quinella in this race and is first-up here, but does go well fresh and should give a decent account. Thermal Current (Weir / Dunn) is only a rough chance, but has been good this prep and will get a good run, wide with cover. Faatinah (Hayes & Dabernig / Allen) has a reasonable record at his best, but he’ll need to be every bit of that here. Gets the blinkers on. Kaepernick (Hawkes / McEvoy) is also first-up, but crucially gets a long way back from the barrier and runs on, which will prove a huge task against this lot. We then have a whole bunch of roughies in what is a very open race. Ocean Embers (Eden / Benbow) is going well and won well in Hobart last start, but gets a fair way back here and will struggle to get over the top of them. Miss Promiscuity (Hayes & Dabernig / Mallyon) struggled in this last year and is only a very rough chance for mine. I Am A Star (Nicols / Williams), El Divino (Weir / Yendall) and Guard Of Honour (Lees / Thompson round out the longer shots. Aegean Sea (Conners / Mertens), Ready Sunshine (Balfour / Dee) and Shakespearean Lass (Carey / Payne) aren’t good enough here. Wild Rain (Kavanagh / Baster) is at her best over 1000m, and dropped right out last start in the Rubiton despite subsequently being found to have no issue. I’m happy to risk her. Missrock (Laing / Holland) has been a good horse, but is first-up here and won’t be bothering the main chances. I’ve got Hellbent on top from Extreme Choice, Shiedel and Fell Swoop. With it being so open there will be some good value available I think, headlined by Hellbent and Shiedel which look attractively priced.